BANDUNG, 28 Nov, 2012 – The National University of Malaysia (UKM) and the Universitas Padjadjaran (UNPAD) in Indonesia can pioneer new knowledge and step up cooperation for the benefit of both countries. UKM Vice Chancellor Professor Tan Sri Dato ‘Wira Dr Sharifah Hapsah Syed Hasan Shahabuddin said every university should contribute to peace and prosperity through economic growth and social development. Prof Sharifah Hapsah said international cooperation and collaboration is required in a world engulfed by the wave of globalization. She was responding to the citation given when receiving the Honourary Causa Doctorate on Education Management conferred on her here this morning. The Hon Doctorate was confirred by its Rector, Prof Ir. 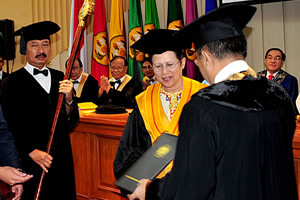 Dr Ganjar Kurnia in a special ceremony at Rectorate’s main hall at its campus in Jatinagor here attended by members of its Senate and Assistant Rectors and other UNPAD academics. Present at the ceremony were Deputy Vice Chancellors, Prof Ir Dr Othman A Karim (Students and Alumni Affairs), Prof Dato’ Dr Saran Kaur Gill (Industry and Community Partnership), Dean of the Faculty of Medicine and Director of UKM Medical Centre, Prof Dato’ Dr Raymond Azman Ali, a number of Director of Institutes and Professors. A number of UKM students undergoing their joint Medical Degree studies with UNPAD as well as a number of other foreign students and UKM alumni attended the special function. In her speech on The Research University in the Innovation Economy, Prof Sharifah Hapsah expressed her gratitude to the leaders and Senate of UNPAD by sharing her experiences in UKM as a research university. 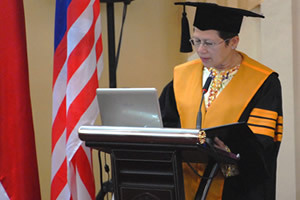 She said UKM itself had undergone major efforts to form a culture of innovation and entrepreneurship (I & E) through three strategies: providing quality education to produce sources of innovation and entrepreneurship; providing access to feedback from the research and development (R & D) into innovation and commercialization; and nurturing leaders for effective governance and talent management transparently. Several initiatives were implemented to nurture a culture of I & E by introducing elements of entrepreneurship into the curriculum, building capacity for commercialization of R & D, international networking, leadership and talent management as well as providing the necessary infrastructure, policies and transparent governance. Prof Syarifah Hapsah stated that having a lot of innovations in universities in itself is not enough. The inventions will sit idly in the shelves unless something is done to attract consumers by having added value. Inventions and innovation have little use unless earmarked for further development by talented entrepreneurs. Apart from that, she noted that UKM and UNPAD officially commenced academic collaboration in 1985 through scholarly activities such as joint research, academic exchange programs, exchange of graduate students and supervision of post-graduate students. The Cultural Symposium organised jointly by Malaysia and Indonesia (SKIM) bienially since 1985 has strengthened not only the academic cooperation between UKM and UNPAD, but in ASEAN in general. The SKIM project has spanned all dimensions of life, including Science, Technology and Innovation, which saw the proliferation of a variety of new theories. According to the Quacquarelli Symonds (QS) World Ranking for Universities, 2012, UNPAD was ranked number 185 in Asia, while UKM was ranked 31 of 50 world universities below 50 years old.